I rarely spend much time on Facebook, but today was an exception. People started yesterday posting pictures of their moms for Mother's Day. 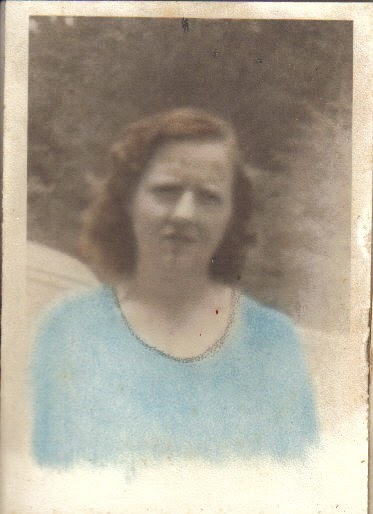 I took a lot of pictures of my mom, but the one below was taken not long after she married my dad. Her smile was a little wonky in most of the pictures taken of her, but she looked happy in this photograph. That's how I like to remember her. Her health waned the last few years of her life, but she never lost her twisted sense of humor. That gene passed intact from her to me and I'm thankful for that. A lot who I became was because of my mother. She taught me so many things. She had a soft spot in her heart for underdogs and children. She instilled the habit of hard work and I learned, from her example, to do the best job I could do with what I had at hand. I strive to do that though I often fall short. If I could tell the Facebook friends one thing it would be this: Don't miss an opportunity to tell your mom you love her, and how much she means to you. An amen to Launna's comment and It is such a meaningful entry. PLUS I an a sucker for the older photos. I love 'em. I think most mom;'s are made of good stuff, but I think there were some special ones. Yours seems to fit in the special category. Some of us are just fortunate, to have the BEST mom. THANKS for a heart warming post. I'm fortunate in that I still have my mom, and that's exactly what I told her on Mother's Day. Our moms are special so special. I always say where would we be without them. Time flies and they are not with us for ever, but always have a special place in our hearts. Like you I had the best loving mom anyone could ever want and I'm a better person and mother because of her. I'm glad they have a Mother's Day celebration every May. It's the appropriate month. What a sweet post Rick. Your Mom sounds like a gem. I love the photo. I call my Mom daily because I know I'm lucky she's still with us. I think one of the best things about aging...and there isn't a lot of good things about aging..is realizing what gifts and knowledge we gained from our parents. I've often said "Gee I sound like my Mom"...and how grateful I am for that! Well Rick, if your Mum is watching she'd be pretty chuffed by this post, not to mention proud. Sadly I didn't have a great Mum so it gladdens my heart every time I learn of someone who does or did. How lovely. I miss my mother too. However I carry a bit of her with me because of her love for me.